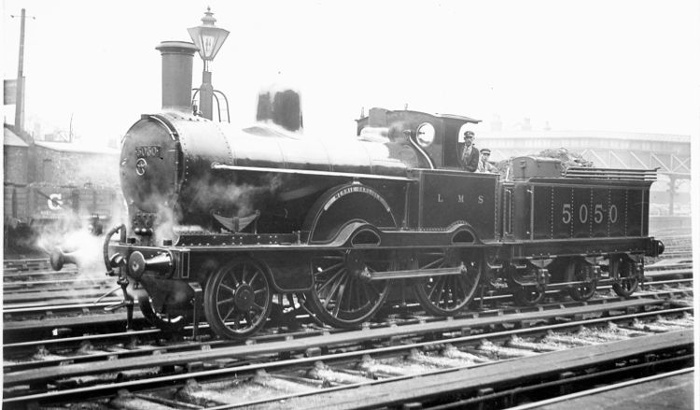 The engine is ‘6ft 6in Jumbo’, originally LNWR 860, LMS 5050 Merrie Carlisle, which according to ‘LMS Liveries’ by Jenkinson and Essery, was the first Jumbo to be painted red in 1923. Only four Big Jumbos were ever painted in LMS red, the other three being 5012 John Ramsbottom, 5036 Novelty and 5069 Penrith Beacon. So there is no mystery about the engine but, as it is such a nice picture, many members will enjoy seeing it anyway. The mystery is the location. Where was the picture taken? The clue must be the footbridge in the right background. I believe that the location is the down main line at the western end of Chester station. The photo is taken from the down platform and behind the footbridge (which was one of three connecting the platforms, which were particularly long) was until recently the large LNWR goods warehouse. The bridge also gave a pedestrian access from Hoole Road and closed in the late 1960�s Looking to the left side of the photo. It later lost sections of its overall roof. In the mid 1960s it provided a little-frequented view point for loco spotting for me and my friends, with a fair amount of light engine movement under it as engines went to the west end to turn on the triangle of lines forming the routes to Holyhead and Birkenhead. The sequence of lines going away from the platform are the down platform, the next line out is a short spur, and then the down main on which the loco is standing. Beyond are the up main and platform lines and the up and down fast lines. The GCR wagon is against a high level loading dock which was just inside the gates leading into the goods depot. The GWR has its own depot on the opposite side of Hoole road. .